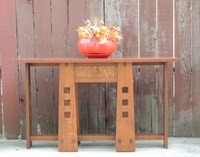 I am a custom furniture maker specializing in the Arts & Crafts style. 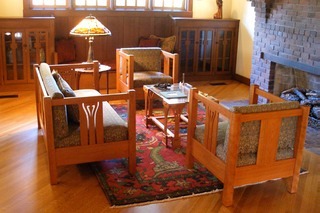 My design inspiration is drawn from the works of Charles Rennie Mackintosh, Gustav Stickley, Charles & Henry Greene, and many other great craftsman of the early 20th century. I design original pieces and collaborate with clients. Some collaborations are as simple as working with given dimensions, others involve fulfilling the client's vision of the perfect piece. In either case, absolute satisfaction is the goal. This web site serves as a portfolio of my work. I invite you to browse through the Furniture Gallery and the Drawing Board sections. If you see something that interests you or have an idea of your own, please contact me about design options, pricing, and availability. Be sure to check back from time to time-- I will be constantly updating the site with my latest creations.